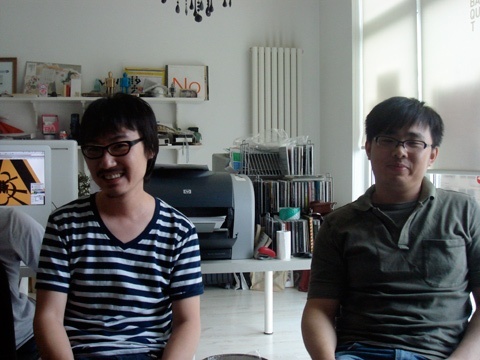 On august 1 2007, vi11age meets up with MEWE design alliance, in their studio in an apartment building in Wangjing, Beijing. 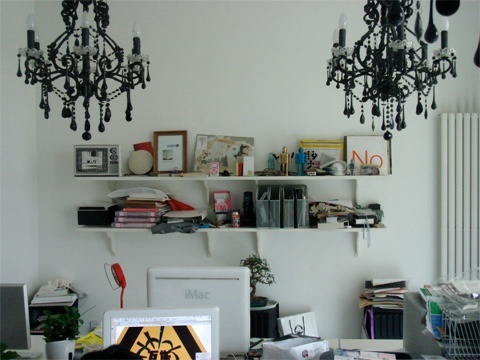 MEWE is a small graphic design office, vi11age speaks with partners Liu Zhizhi, He Yun and Guang Yu. Very much obliged for translating, Lee Ambrozy. As a reason for our visit to Beijing, we mention the amount of attention given to China in Europe. MEWE. Why is China a hot topic? vi11age. China is very much in the centre of attention because everything is being made here. The only thing going back in the containers from China is recycled paper. It's the only thing China needs from The Netherlands. m. Yes It's a super power! But The Netherlands looks to be more advanced and futuristic. v. Maybe it used to be like that, but now we come to China to see the future. Take for example those inventive electrical bikes that zoom across the streets without making any noise. v. There seems to be a western influence in your work although none of you ever studied or worked abroad. Where do you think that comes from? m. 'Even if you have never eaten pork you have seen the pig running'! v. Delft blue earthen-works started of as a meagre substitute for dried up imports of Chinese porcelain. It is however an example of very unique cultural craftsmanship that can grow out of initial 'copying'. v. But it's a very pressing issue if you talk about Chinese production in a broader sense, we most likely had fake Chinese beer last night. m. We see a lot of copied furniture in the stores, and there are also quite a few designers that don't really care to do something original. For example this designer from Shanghai. We call him Superman Copyman. He also exhibited last year in Rotterdam. However he showed all this work from his students and assistants and said it was his. v. A lot of your clients seem to be in the arts sector, do you also work on more commercial projects? m. In China there is this saying that says you either understand the business or you don't understand the business. MEWE is more on the not understanding side. We do most of our work for galleries, artists, architects and such clients. However we'd love to do packaging for cigarettes and alcohol. v. Your work consists mostly of books that are designed around a central idea, expressed in an often unorthodox materialisation. m. The ideas are more important for us to talk about than how it's produced. But the ideas, or concepts if you will, are very much expressed by the material. So the production and materiality is very important to us. v. It's close to impossible to do things like this in Europe. m. Same here, we have to like hold a gun to their head to make them do it. It's also really hard here. The printing process is horrible. It's always like, doom. You always have to go the printer yourself and show them and stay there to check. v. A lot of possibilities arise with cheap labour. However for a western designer it might be even harder to produce in China. m. If you don't understand their processes it's going to be difficult. But if you do know their processes it's even more difficult. v. Finally, are those what we think they are? 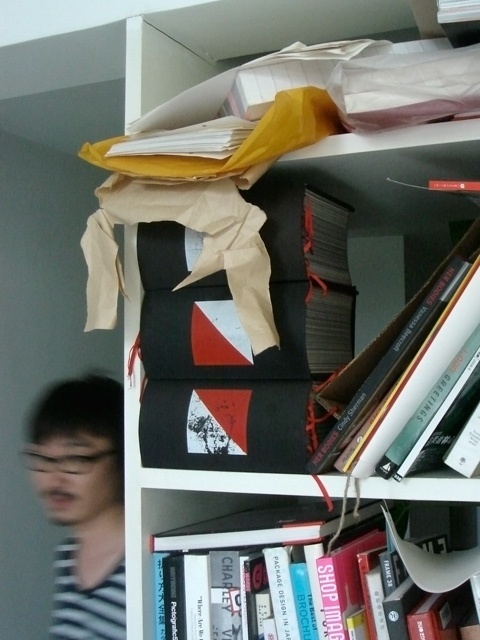 m. Yes, three copies of the Chinese edition of the SHV book by Irma Boom. There was this guy standing outside the academy with a copy of the book, selling it for Y200 (€20). We asked him if he had more. We immediately bought all the copies he had.